By Joseph Herron – With less than two months until the highly anticipated face-off between three division world champion Miguel Angel Cotto (37-3, 30 KOs) and Austin “No Doubt” Trout (25-0, 14 KOs), many fight scribes and boxing fans are concerned that the Caguas warrior picked on the wrong Junior Middleweight title holder. The current WBA Junior Middleweight Champ is quite certain the future Hall of Famer made a miscalculated decision in selecting him as an “opponent”. Although the Las Cruces, New Mexico resident is always confident before a big fight, Austin seems eerily self-assured that he will indeed be successful on December 1st. The 27 year old title holder will undeniably enjoy a three inch height advantage and a five inch reach advantage when he and the eleven year veteran meet in the ring. But the Puerto Rican favorite has been able to overcome similar disadvantages facing larger Junior Middleweight fighters in previous match-ups. In June of 2010, Miguel Cotto originally won the WBA Junior Middleweight title when he defeated the 5’11” Yuri Foreman in Yankee Stadium by placing intelligent pressure on the fleet footed Belarus native. During his title winning effort, the 31 year old fighter cut off the ring effectively and worked his way inside Foreman’s defense by using his forceful, piston-like jab sporadically. Under the tutelage of legendary trainer Emanuel Steward, Cotto also took away the defending title holder’s height advantage by shooting his left hand to the eyes and forehead of the much taller fighter; ultimately forcing the rangier boxer to crouch down to a smaller level. But will Miguel Cotto be able to use his jab effectively against the technically proficient Austin Trout? In his previous outing against the always formidable Delvin Rodriguez, the current WBA Champion used his southpaw stance and brilliant footwork to negate the customarily effective jab of the 32 year old fight veteran. According to compubox statistics, Delvin was only able to land 6 of 160 jabs thrown throughout the twelve rounds of action; a staggering 4% connect ratio. Without the benefit of a successful jab, Rodriguez was unable to set up any significant offensive attack during the entire championship bout. Will Miguel Cotto be able to apply his usual brand of intelligent pressure without the use of his primary weapon? 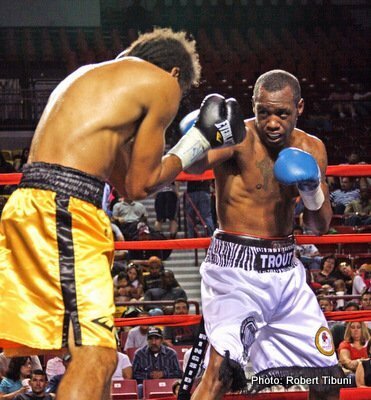 Will Austin Trout be able to successfully negate the lead hand of the most experienced and decorated fighter he’s faced to date? According to the young title holder, there’s no doubt he will be able to take away Miguel Cotto’s entire arsenal of punches on December 1st. You are here: Home / Boxing News / Miguel Cotto vs. Austin Trout: Will Junito be in trouble on Dec 1st?